"The Roaring Twenties" is the only decade in American history with a widely applied nickname, and our collective fascination with this era continues. But how did this surge of innovation and cultural milestones emerge out of the ashes of The Great War? No one has yet written a book about the decade's beginning. 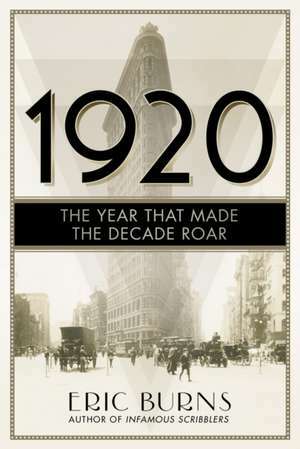 Acclaimed author Eric Burns investigates the year of 1920, which was not only a crucial twelve-month period of its own, but one that foretold the future, foreshadowing the rest of the 20th century and the early years of the 21st, whether it was Sacco and Vanzetti or the stock market crash that brought this era to a close. Burns sets the record straight about this most misunderstood and iconic of periods. Despite being the first full year of armistice, 1920 was not, in fact, a peaceful time--it contained the greatest act of terrorism in American history to date. And while 1920 is thought of as starting a prosperous era, for most people, life had never been more unaffordable. Meanwhile, African Americans were putting their stamp on culture and though people today imagine the frivolous image of the flapper dancing the night away, the truth was that a new kind of power had been bestowed on women, and it had nothing to do with the dance floor. . .
From prohibition to immigration, the birth of jazz, the rise of expatriate literature, and the original Ponzi scheme, 1920 was truly a year like no other.